Dutchess County T.Webber Plumbing, Heating, Air & Electric. Are you a Dutchess County resident looking for a plumbing, HVAC or electrical company nearby? Look no further. Since 1989, T.Webber has been providing Dutchess County residents with conscientious technicians, timely response and quality guaranteed repairs. From Poughkeepsie to Fishkill, Wappingers to Hopewell Junction and everywhere in between our staff is available all day, every day to ensure you have the service you need, when you need it most. A plumbing, heating, or electrical emergency can strike at any time. When you have an emergency, it’s important to know you have a trusted company to call upon. T.Webber has been providing Dutchess County residents with prompt and professional emergency service for over 30 years. 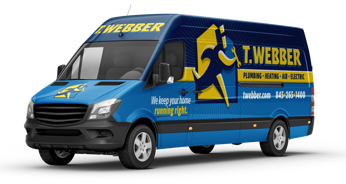 When every moment counts, call your local plumbing, heating, air conditioning & electrical specialists – T.Webber.